Greetings and salutations, everyone; yes, once again it is I, Mani the I guess pretty regular-sized purebred border collie, filling in for the guy I live with, and here to bring you the latest news from our garden. You may remember me from such posts as “The Missing Grass”, among so many, many others. Here I am in a characteristic pose. You probably didn’t know I had retractable ears. They come in handy, sometimes. It’s okay to be jealous. The last few days were extremely hot. I mean, I was roasting. The guy I live with was so worried that I might get baked, just sitting in the house, that he bought me a new toy. It’s pretty nice. But before I talk about anything else, like the irony of how roasting I was compared to today, I should explain the title of today’s post. You may recall, in my last post (“The Missing Grass”), I showed the space where the missing grass used to be. I forgot to mention that there was also a depression, or low spot, in the “eminence” upon which I sit, and the guy I live with suggested it might be a “border collie wallow”, though I was quick to point out that we purebred border collies don’t make wallows, let alone lie in them. Just yesterday, in the evening, as I recall, the real reason for the missing grass was revealed, and I have to admit that I wasn’t very proud of it, for, in fact, it turned out that the back yard wasn’t entirely bunny-free, as I thought it was. I chased the bunny out of the yard, but we both agreed that had to be the reason for the missing grass. It wasn’t giant invisible gophers after all. Now back to how hot it was. It was really hot. Like a zillion degrees, or even more. At seven in the evening it was so hot in the house that I had to go outside to cool off, and it was hot there, too. I thought it might be a good time to think about an air conditioner, but nothing was done about it. We do stay up late, now, and so my upstairs fort is cooled off by window fan, by the time I’m ready for bed, and the guy I live with says that the night air is good for me. The guy I live with said that when the purebred border collie who lived here before me, Chess, began to get on in years, that he and the guy I live with would stay up late, and watch “Perry Mason”, while the fan in the upstairs bedroom window cooled things off, so that Chess was comfortable when he got into bed. And besides, when the guy I live with was little, he said, he used to visit his grandparents’ house in Los Angeles, and would go to bed hearing the theme music to “Perry Mason”, so there’s some sort of pleasant memory there. I guess I’m digressing a lot. 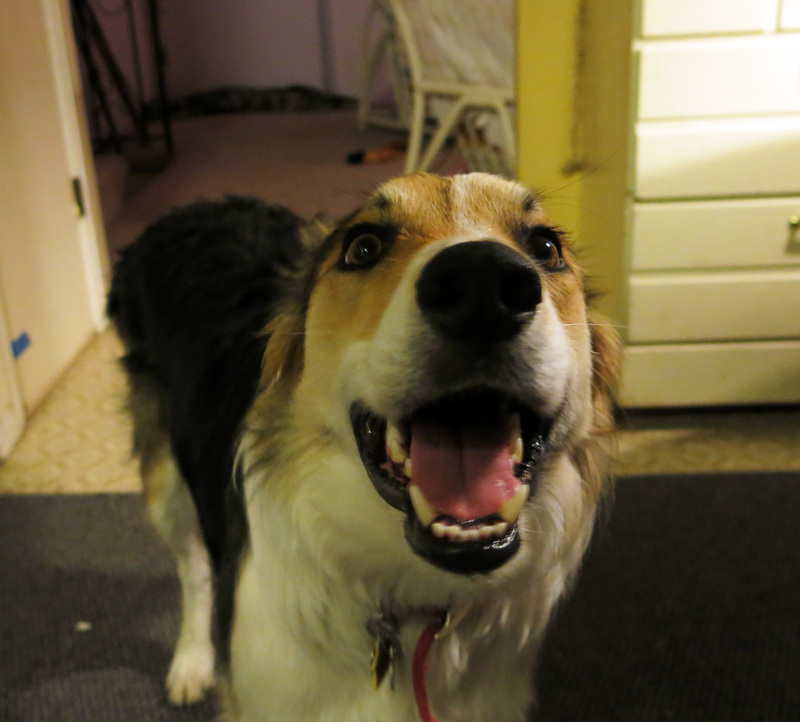 We purebred border collies are usually super-focused on one thing or another, but we also do digress. 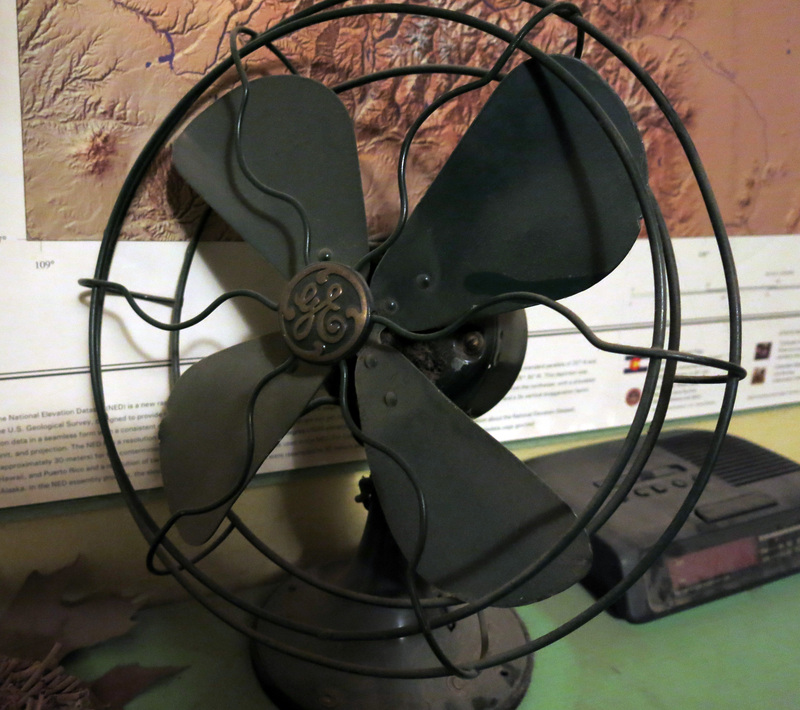 I guess since I’m talking about fans and “Perry Mason” I might as well say that, downstairs, there’s a fan which was a used as a prop in one of the “Perry Mason” movies. No, really. So I can digress, but make everything seem connected at the same time. That’s how advanced we purebred border collies are. It really is time to talk about the weather again. Today things changed. Then the sun came out. Then the second storm passed over our house. Then the third storm passed over our house. Not all of this is just rain. And that’s the thing. Where we live, and especially (according to the guy I live with), when thunderstorms approach, gardeners begin to worry about hail. Golfball-sized (or bigger), garden-obliterating, hail. The guy I live with said it first happened here in 1991, and that every plant in the garden was completely defoliated, and bark was stripped from the trees. That sounds pretty scary indeed. The hail this time was “only pea-sized”, he said. Then the fourth storm passed over our house. We didn’t get a movie of that one, and it rained for a while. The guy I live with said he hoped the rest of the summer didn’t go that way, the way it did two summers ago, when poor Chess had to endure what the guy I live with said he estimated as two hundred and seventy-five thunderstorms passing over or by our little neighborhood in a four-month period. The guy I live with said he counted only ten days with sun all day. That sounded very scary, and very tiresome. So I hope we have a real summer this year, though I would just as soon not roast every day. The guy I live with said that the best way to end a very dark and scary day, since the mystery was finally solved and it wasn’t a giant invisible gopher, was with a dried cow ear. There really is nothing like a dried cow ear, sometimes. You might just have to trust me on this one. Dear Mani, maybe you don’t remember, but I do, when you and water were foes — when water was something only good for chomping (I believe there is evidence of this, on film, and on this blog). And now look, there’s you pawing ever so gently at the H2O. I like the story of TGWLW about Eisenhower-era LA, and I try to imagine how kids today will look back on 2016 with nostalgia the same way. I imagine that the grandparents of TGYLW thought they were living with cutting-edge technology on those Saturday nights with Perry Mason: the latest in aerodynamic fans, sophisticated theater telecast right to your own home, ice for the highballs churned out in copious quantities in the electric refrigerator. Hard to think that 50 years from now people will look back and write fondly about ring tones, or the Kardashians. Yes, I like water so much now that the guy I live with can only water the garden on days when I’m away at Day Care. 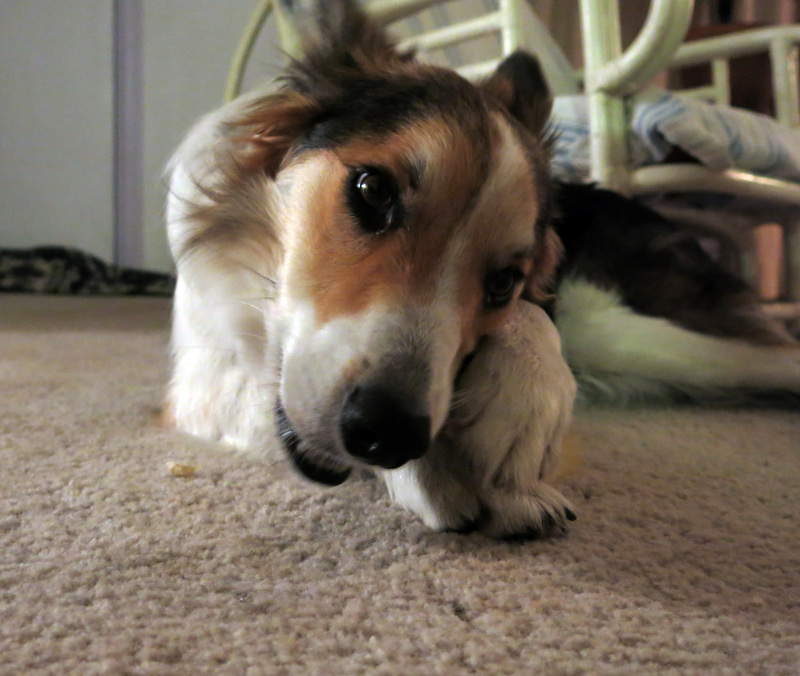 (Which, by the way, I can still go to, even though it’s called “Puppy Day Care”.) The guy I live with says that one of his childhood memories is the sound of ice tinkling in a highball glass, but that the ice came from something called “an ice tray”, which was made of metal. Lots of things were made of metal in those days. Like the “color TV” which appeared much later, after he moved to Colorado and was older. You might not believe this, but the guy I live with barely knows who the Kardashians are, and I don’t, at all. He says not knowing things isn’t the end of the world. I am still quite a puppy. At least at heart. The guy I live with says that when he was little (a very, very long time ago) he would get something called “Jell-O” in fluted metal cups, and the Jell-O would taste like the metal, and it would be hard to get the Jell-O out of the fluted part. He says the stuff wiggled, which sounds scary. I grew up in Los Angeles Mani, but I have always loved radio , and there was a station that played old Orson Wells radio dramas late at night and used to sneakily listen to them past my bedtime when I was supposed to be asleep. Of course we watched Perry Mason too, but I didn’t have to be sneaky for that. Nor did I have to be sneaky to listen to Vin Scully. I listened to Vin when I was a little kid, and I still listen to him now. That’s a baseball thing Mani, in case you didn’t know. There was a ball out in the field, but the guy I live with said that was a “softball”. It got mowed over when they mowed the field. His grandparents’ house was at 4736 Oakwood Avenue. It’s long gone now, but the Dover Hotel is still there, on Google Street View, and looks the same as it did in the 1950s. It was a neighborhood of nice houses built before the First World War. He says Denver is sort of like L.A., blindingly sunny and all, but with cold winters, and storms in the summer. He says a lot of things, though. Dogs who digress tell the most interesting stories, so I’m good with that. We’ve been having crazy weather in Portland OR too. Yesterday cool, hot, cool, rain, hail, hot, cool. You get the drift. Looks like I can get out there between rainstorms today. p.s. My niece Jill would be crazy for you Perry fan. Thanks; I think I’m pretty interesting.,,, It’s 86F (30C) right now, at six p.m. (fifteen percent humidity), and it’s supposed to be about 90F for the next few days. So no thunderstorms or anything; just me roasting. 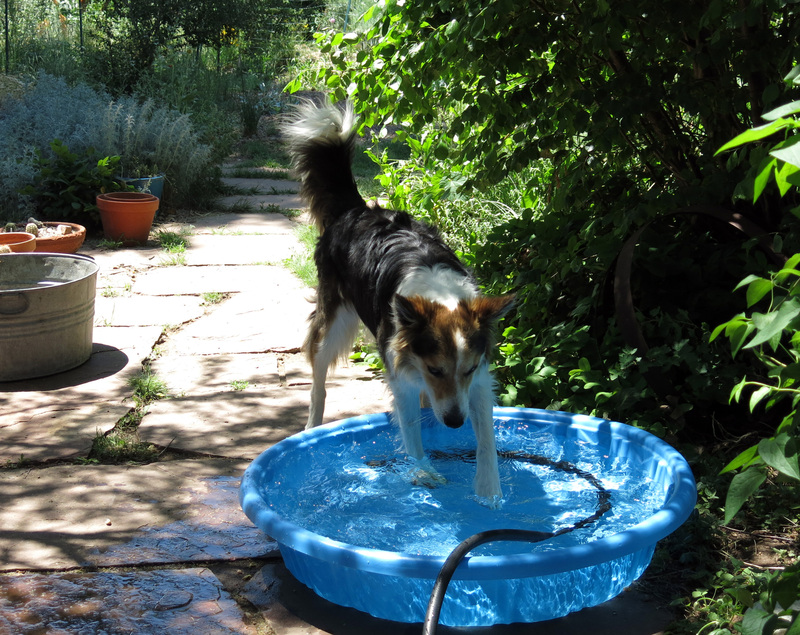 Purebred border collies do not like hot weather. I spent most of the day today in the pool, at Day Care. I’m not an idiot. The guy I live with likes hot weather, so there you have it. Oh, to have a pool! You are one very lucky dog, Mani. Seems it arrived timely, too. I think the most excellent writing is digressive, so you just go right ahead with the way you tell a tale. Keep loading the rain videos too. Love the sound and sight. 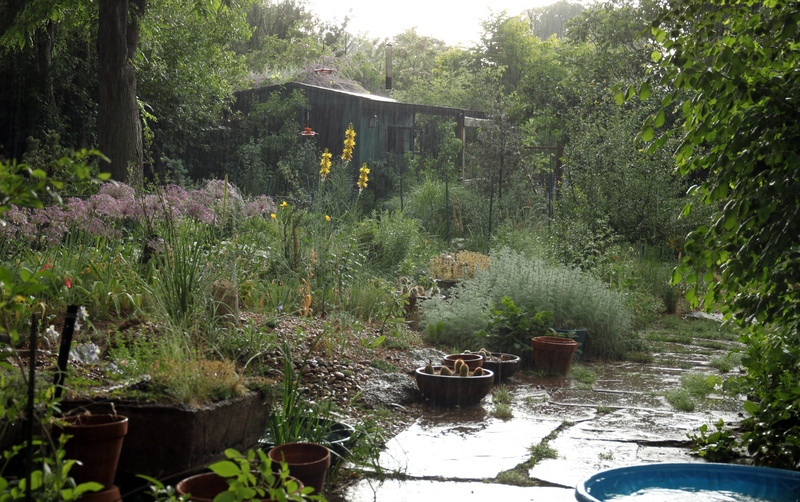 Your yard shows well in the rain, and the part you filmed looks to be filling in. Are those cacti in the shallow pot, the upright plants? How do they respond to rain, rain, rain? They’ll soon be drying out as it’s hot here and due to get hotter by this weekend, so I know the heat will show up at your place. Maybe you’ll need another pool. Oh, well. I go into air-conditioned comfort to hear an expert speak on Richard Henry Dana and his book “Two Years Before the Mast.” The old rose garden in Old Town is behind a former grog shop in which RHD hung out, probably escaping the heat. Or perhaps it rained in the olden days. Stay cool, Mani, and stay focused. Yes, those are cacti in the shallow Mexican dishes. Both cacti and dishes stay out all year long, and when it rains and rains, the cacti get bigger and bigger. There was a copy of TYBTM here, which was the guy I live with’s grandfather’s, but it was given away, during one of the big giveaways. The guy I live with’s mom’s first cousin lived in Coronado. He was on an aircraft carrier. As the captain. But when the guy I live with was little, they rarely went to San Diego because it was so far away and there wasn’t anything much in between except Capistrano and the swallows. Well, so anyway, the guy I live with, who fancies himself as someone who knows a bit about computers, accidentally deleted the Apple QuickTime Pro on his laptop and so now it’s like gone (unless it’s still on the computer upstairs), so now some thinking has to be done, in order to upload movies.